The NES had an available pallet of 54 colors. However, only 25 could effectively be onscreen at once. You had 4 pallets for sprites (that is, characters and moving objects in the foreground layer), 4 pallets for tiles (the individual static squares forming the background), and one backdrop color to which the screen is cleared. Each of these sub-pallets consists of four colors, but one has to be transparent, so effectively 3. That means Megaman, who cheats and uses two sprite pallets only leaves six colors available for characters besides the blue bomber himself! Which, in turn, is why his enemies tend to be one color, his life and bullets another, and his other powerups the same color as Megaman himself. I’m trying to make a sprite comic (and subsequently, a game) that looks like it could have been on the NES. However, I’m cheating. I’m not limiting the colors I have available to those available on the NES. I am however, limiting the number of colors I have available to a similar number. I have built a pallet of 25 colors to use for my first comic. I will eventually build a second pallet containing all the other colors I can use for the comic and game as a whole, with (once again), only 25 allowed at a time. 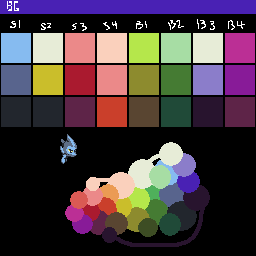 In fact, I am making a rule that I have to specifically chose which colors exist in which sub-pallet. Which brings me to a final point: Constraints are not something that constricts creativity: true creativity comes not from abandoning constraints, but from exceeding what people thing are possible within them. You will notice that the pallet tends to add a touch of blue even to the warm colors like yellow and red. But, of course, this comic is set underwater. And by relating the colors together in this way, I unify the picture as a whole. The other thing is that the overlapping circles have two properties: Every color that overlaps another is A) Clearly distinct from that color, and B) Clearly related to that color. This allows for some serious heavy-lifting in terms of picture generation: Any two adjacent colors can be used to represent different shades of the same color on a sprite while still looking good. But there’s contrast enough that you can tell everything apart — none of the colors will blend together except as a distinct shadowing effect, as per the recolored Jump Sprite. Unfortunately, as per the recolored Jump Sprite compared to the finished animations below, the result is a distinct lack of subtlety in the coloring. But this is a necessary sacrifice to achieve the Not-a-NES look I’m going for. I'm a wannabe writer, wannabe artist, wannabe programmer... Wannabe pretty much everything. This entry was posted in Mushroom Kingdom, Octopus Ink and tagged colors, constraints, NES, pallet, sprite comic. Bookmark the permalink.